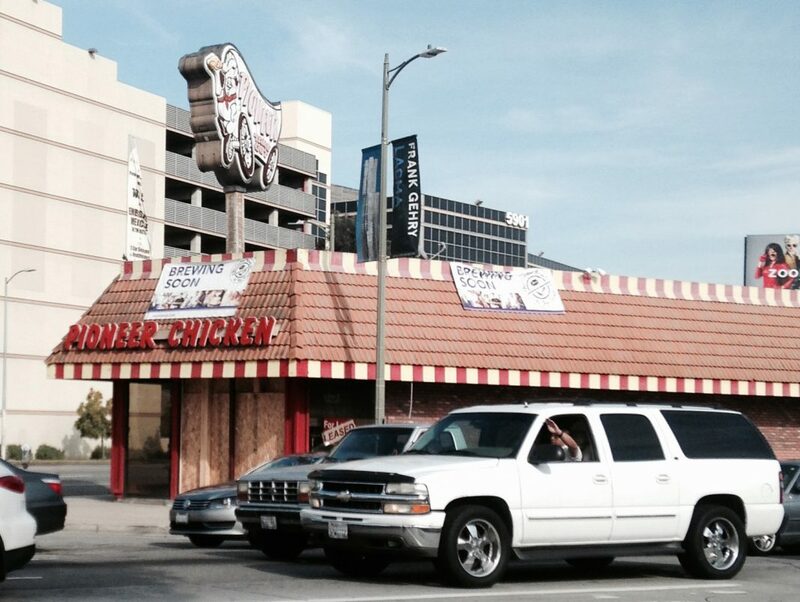 Fifty-five years ago H. R. Kaufman opened the first Pioneer Chicken restaurant in Echo Park. It was a tiny take-out stand in the parking lot of Pioneer market (now Lassen’s) on Sunset across from the drug store where he shined shoes as a kid in the 1940s. The chicken chain grew to more than 270 stores by 1979 when the franchise pictured above opened on Olympic near Fairfax. The restaurant had big glass windows, brick veneer, and an enormous rooftop sign made from vacuformed plastic and featuring the chain’s mascot Pioneer Pete driving a chuck wagon. Tommy Gelinas honors the history of the San Fernando Valley at his Valley Relics museum in Chatsworth. They cast a wide net that captures artifacts from the entire history of the valley, including the fast food era. The Olympic Boulevard sign was one of the last Pioneer Pete figures left in the wild and Gelinas thought it belonged in a museum so he made a deal with the restaurant owner. “He gave me a bunch of tokens, outfits, original cups from the 70s,” Gelinas said. He had everything but the backlit plastic on the roof. The revolving sign kept blowing in the wind– until last month when it was spotted on eBay. The business owner was gone but the property owner was preparing to remodel the empty space for a new tenant – Coffee Bean and Tea Leaf.